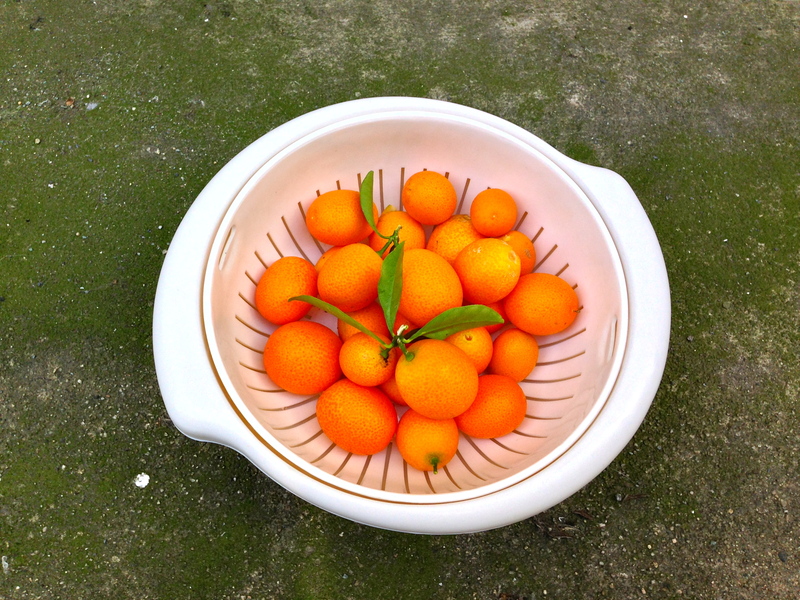 Kumquats are a big deal around Chinese New Year. The word “kumquat” is derived from the Cantonese gam gwat which means “gold orange.” Besides gold being a symbol of prosperity, the word gwat sounds very similar to the word for “good luck.” If there’s anything Chinese people like more than a good bargain, it’s symbolism, homonyms and superstition. For example, it is advised to get a haircut and/or wash your hair prior to the new year and definitely skip doing either on New Year’s Day (some strict adherents won’t even wash on NYE). The word for “hair”, fa (in Mandarin) sounds like the word for “prosper” and the last thing you want to do is wash/cut away your prosperity at the beginning of a new year. Don’t tempt ancient Chinese wisdom! Makes an 8×8 pan. Number of servings depends on how big you cut the squares. Cream butter, sugar and salt together in a large bowl. Using an electric mixer, add in flour, 1/2 cup at a time. The mixture will be slightly crumbly. Pour into an 8×8 glass baking pan lined with parchment paper. Press into an even layer of dough. Prick with a fork. Bake for about 20 minutes. Better to err on the side of underbaking rather than overbaking since it’s going back in the oven. Set aside to cool. You can even make it the night before. Using a paring knife, cut each kumquat in half and pick out the seeds using the tip of the knife. This is the most time-consuming part. Puree the kumquats in a blender. In a mixing bowl, combine the kumquat puree, liqueur, sugar and lemon juice. This is a good time to do a quick taste test. 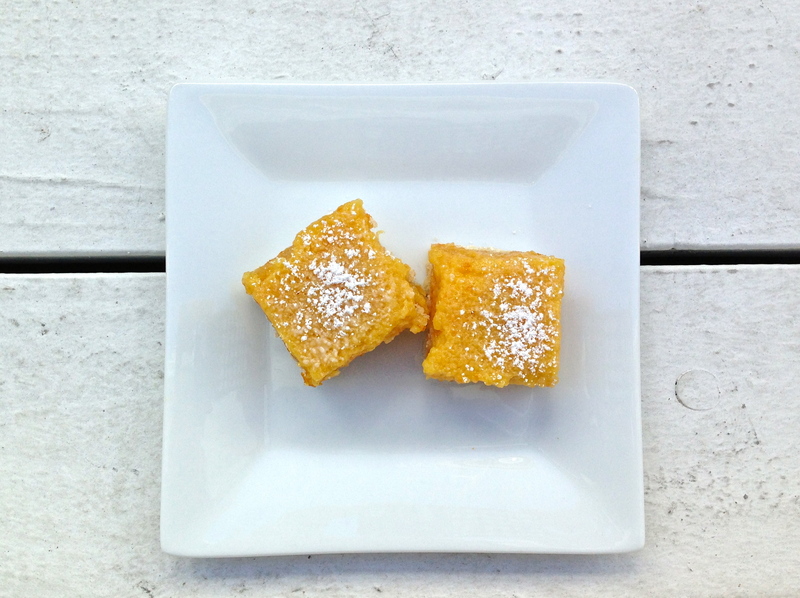 I like my kumquat bars tart but you can adjust the sugar and the lemon juice a little bit here to suit your tastes. Add the egg+yolk, flour and baking powder and mix well. Bake at 350 for 20 mins. If the center is still runny, continue baking, checking every 10 minutes (the tiniest bit of wiggly in the very center is okay). Should not take more than 40 minutes at most; if it is still runny at that point, I apologize, but something has gone awry. Let cool completely. Trim off the edges and then cut into neat squares. Using a fine mesh sieve, dust the tops with powdered sugar. Happy New Year’s Eve. Now go wash your hair before midnight!